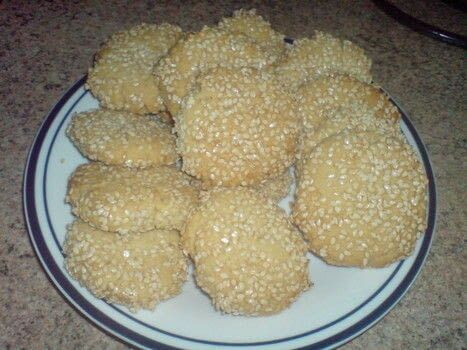 scrummy sesame seed & honey cookies! Preheat oven to 175°C/Gas Mark 4. In a small bowl stir the hot water into 2 tbsp of the honey. Add the sesame seeds and stir well to coat. Set aside. In another separate bowl, cream together the butter, sugar and remaining 2 tbsp of honey, until light and fluffy. Beat in the flour mixture - the dough will become quite stiff. Pinch off small pieces of dough and roll into 1 inch balls. Roll into the honeyed sesame seeds to coat and place 1 1/2 inches apart on a lined baking sheet. Flatten each one slightly with the bottom of a glass. Bake in the centre of the oven for 15 minutes of until just golden. Leave the cookies to cool for 1 minute, then transfer to a wire rack to cool.